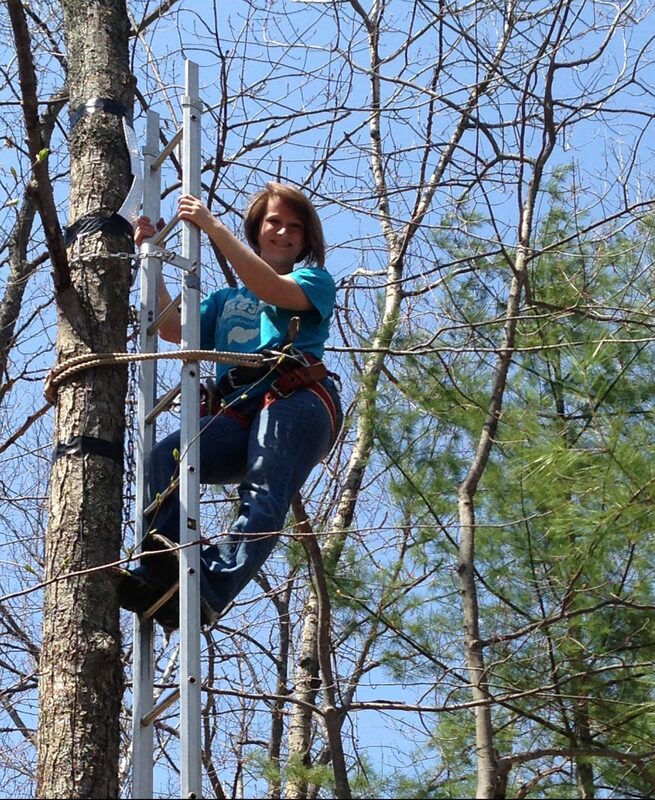 Ashley Matheny installs a moisture sensor within a red maple tree’s trunk at a research site in Pellston, Michigan. Rodent-proofing moisture sensors and plowing through dense forest undergrowth gives Ashley Matheny a glimpse into the survival dance of trees. If not for the pliable nature of water, Ashley Matheny’s career might have followed a different course. Back in 2010, the West Virginia native was studying water interactions with dams for the U.S. Army Corps of Engineers after completing a bachelor’s degree in civil engineering. One summer morning, she witnessed a phenomena on the Ohio River that would forever change the way she viewed hydrology. Matheny saw a front of rapidly moving water develop where there were no rocks or objects to raise the water height. The water rushed downstream to slam into slower water, and piled up chaotically behind it. Luckily, Matheny’s not one to approach scientific disciplines lightly. Growing up in a small town along the Ohio River water skiing, canoeing and camping meant her passion for nature runs deep. As an undergraduate at The Ohio State University, she immersed herself in measuring water use by trees in a section of Michigan forest under environmental stress. Combining her passions, the project turned into her master’s and doctoral theses (and her first National Science Foundation grant). She has since built a reputation for ground truthing the water dynamics of trees to inform conservation efforts. Matheny expanded her research focus during a postdoctoral position at her alma mater last summer to incorporate detailed tree hydrology data into computer models of the cycling of water and bioactive elements between the earth and the atmosphere. Jackson School Professor Jack Sharp noted that researchers have been “pretty ignorant” about how vegetative hydrological processes impact land surface models because plants have been harder to evaluate than satellite-accessible attributes like cloud moisture. For her part, Matheny looks forward to working on hydrology projects with Jackson School faculty. She plans to work on water research with Daniella Rempe, also an assistant professor of hydrologic and water sciences; on climate modeling with professors Zong-Liang Yang and Bob Dickinson; and on soil moisture analyses with Todd Caldwell and Michael Young of the Bureau of Economic Geology’s Texas Soil Observation Network. Matheny will “go local” by expanding her work to include studying native Texas trees. Yet she intends to keep in mind the broader need for enhancing land surface models’ representation of vegetation. Current models often incorporate measurements of moisture and other features for dozens of soil and atmospheric layers, while plants might occupy a single sliver of information between those data stacks. Moreover, modelers often represent all trees in one category as if they impact resource cycling equally. “If we could make it so that temperate deciduous forests are not represented as one big leaf, but as the individual hydraulic classes that the trees actually represent, we could reduce the uncertainty in our models,” Matheny said. The Michigan tree study highlights why lumping tree species fosters such uncertainty by showing that different species have a different way of handling water storage. Traditionally, modelers have measured gaseous exchange at leaf pores (stomata) as a catch-all for understanding plant interactions with water and gasses. Leaf stomata capture carbon dioxide needed for photosynthesis and growth. They also release water through transpiration, the conversion of ultraviolet radiation from sunlight into water vapor. That process helps trees shed heat and water. To enhance vegetative details, Matheny has spent eight years studying how native tree species adjust their water content in their leaves, woody material and roots in response to changing rainfall and other stressors. Without doing so, a plant could become dehydrated during a drought. She developed probe-like sensors that can be inserted into tree trunks to capture information on water storage and flow through them. These sensors measure water characteristics in straw-like spaces of the xylem inside tree trunks and branches. By combining this data with water-isotope data taken from core samples of tree xylem, she extrapolates how deeply a tree’s roots extend. Matheny has built hundreds of probes over the years that have become increasingly sensitive, while still withstanding attacks to their wiring from hungry forest dwellers. The work resulted in being lead author on a November 2016 article in Ecohydrology that demonstrated that red oaks in Michigan outperform red maples in their hydraulic strategy. The red oaks were found to sink their roots into deeper water pockets. The deeper roots allowed the oaks to access more water to store in woody material. As a result, the oaks could continue transpiring during dry spells that have become increasingly common. Meanwhile, equally prevalent red maples turned out to have shorter roots and smaller water reserves. They closed their stomata during a drought, eschewing the ability to synthesize nutrients and grow in exchange. By clarifying their reduced fitness during water stress, the work could help inform forest management plans and improve modeling of how forests might shift arboreal species under future climate scenarios. Not all of Matheny’s projects have been in temperate regions such as Michigan. As a master’s student at Ohio State, she spent weeks on a Panamanian island walking straight transects through a forest and dodging bullet ants, poisonous snakes and more. The work to catalog a vine’s presence in the tree canopy also required carrying LIDAR equipment. “Hiking in 100 degrees with 100 percent humidity while carrying 50 pounds was not fun,” she admitted. Knowing the value of field work, though, her first priority in Texas has been establishing study sites, including of waterstressed mangroves along the Texas Gulf Coast. Matheny may eventually compare their water use with that of mangroves along an arid coast, such as in Oman, to help clarify hydraulic functions of Lone Star mangroves. She noted that discussing the field experiences that sustain her spirit, and the multidisciplinary aspects of her research, help her bring research alive while teaching.